Whatever you do, don’t let the fairly obvious detail that Broadway Nights is a story about a Broadway musician who spends much of the book pondering why he can’t find the right boyfriend deter you. This is a funny book, and it’s still just as funny if you’re straight. Well, a love story is a love story, isn’t it? And a neurotic musician is always funny. Author Rudetsky is the host of the daily Seth’s Big Fat Broadway on SiriusXM, co-hosts Dueling Divas with Christine Pedi on Saturday mornings, does his Broadway interview show, Seth Speaks Broadway (which is not broadcast from Times Square and hasn’t been for years, I know already) on Fridays, and co-wrote and starred in the off-Broadway (later Broadway) musical Disaster! The man knows Broadway. It shows in this book. 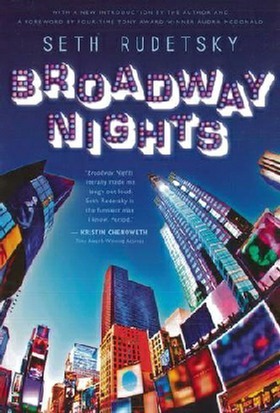 Broadway Nights is a novel. Rudetsky has been careful to point this out, but apparently it doesn’t always work, as suggested by people who sometimes ask about his mother’s operatic career. Stephen Sheerin, the viewpoint character in this first person novel, has an opera singer mother, not Rudetsky. It’s perhaps understandable, because a lot of Stephen’s experiences do seem to mirror the author’s, including the musicals where he’s subbed on piano and keyboards, and if you’ve spent much time listening to his radio programs you’re inevitably going to know about a lot of these things. Seth likes to talk about himself, and since it’s usually entertaining, and often very funny, I think he should keep at it. The premise of the book is that Stephen is writing it as a journal for his therapist, who feels he has commitment problems (among other things). She suggests that his continued subbing in Broadway orchestra pits is a symptom of this, so he’s naturally delighted, and apparently a bit apprehensive, when he’s asked to music direct a new Broadway show. It comes with built-in problems. The producers are notorious cheapskates, and not above conning, or threatening, the production staff to get their way and pay as little for it as possible. Only one of them ever talks. Stephen’s current boyfriend is living with someone else and, while a fantastic dancer, is under the misapprehension that he can sing, and he naturally wants the lead in Stephen’s new show. Stephen may be developing romantic feelings for the show’s creator/director, who’s already living with someone. The show’s star is famous, beautiful, talented, and can sing up a storm, but she also has a reputation as a psycho freak. His assistant is a beautiful young woman with a harpsichord fetish and a penchant for randomly switching to French in the middle of a sentence. Life is complicated. Stephen is sort of a neurotic’s neurotic. He brings on a lot of his problems by automatically imagining the worst, and presuming that everyone is about to do unto him exactly what he’s afraid they’ll do. He’s not always a very good listener, either, but if he always paid attention the book wouldn’t be nearly as funny. He’s even a vegetarian, which I personally tend to think is a neurosis of its own. How healthy is it, really, to eliminate half of the diet nature designed you to eat? You need to buy this book. It’s funny as hell, and if you don’t find gay love stories compelling—I don’t—just keep in mind that the problems Stephen is having are hardly confined to homosexuals. People in general have commitment issues, or just find it hard to tell other people how they feel. Hell, I’ve been divorced for nearly 18 years and I’ve had two dates in that time. I can understand Stephen just fine. The showbiz “insider” themes, Broadway trivia, and the problems of putting on a Broadway musical are all fun to read about. Particularly after producing and starring in a non-musical that could, uhm, maybe have done a little better. Bad reviews are awful, but no reviews may actually be worse. Maybe Stephen isn’t the only one who sometimes has trouble staying on track. Anyway, go buy this. This is where I’d usually direct you to Amazon or Barnes & Noble, but they’re not listing any copies for sale, so it looks like you’ll need to buy it directly from Seth Rudetsky’s site. There’s also Seth’s young adult book, My Awesome Awful Popularity Plan, but I haven’t read that one, so you’ll just have to decide for yourself if you want it. I have read the sequel, The Rise and Fall of a Theater Geek, and it’s quite good.